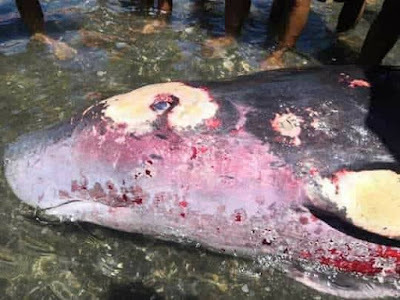 A dead male pygmy sperm whale washed ashore in Barangay Maribulan, Alabel, Sarangani on Saturday morning and was found to have consumed several plastic items. The team also discovered that the organism had eight cookie-cutter shark bites around its body that were shallow and that it had a number of ulcerations in one nematode-filled compartment of its stomach. "These plastics may not be the sole cause of death but it is very clear that our plastic trashes get into the stomach of any marine wildlife." ECPC-Sarangani wrote in a Facebook post. "It cannot be deduced that the primary cause of death of this whale is the ingested plastic but finding these materials inside the stomach is very alarming." This is yet another example of recent cases where dead whales wash ashore full of plastic in their stomachs, reminding us how critical plastic waste in the oceans has become. In November 2018, a dead sperm whale with 6 kilograms of plastic in its stomach washed up on a beach in Indonesia. Another sperm whale which ingested 29 kilograms of plastic trash was found washed ashore dead in Spain in February 2018.